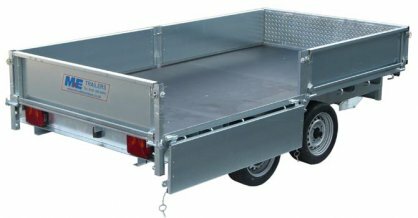 The Meredith & Eyre 16 Series range of Flat Bed Trailers are built to last, with a heavy duty drawbar arrangement developed from our larger trailers, with a Cast Locking 50mm Ball Coupling and Spare Wheel & Tyre as Standard. A 40mm Eye Coupling is also available, as a no cost option. The durability of our heavy duty, low maintenance rubber torsion axles has been proven in the Construction Plant industry and it has excellent ride characteristics to cope with operation in both laden and unladen conditions.